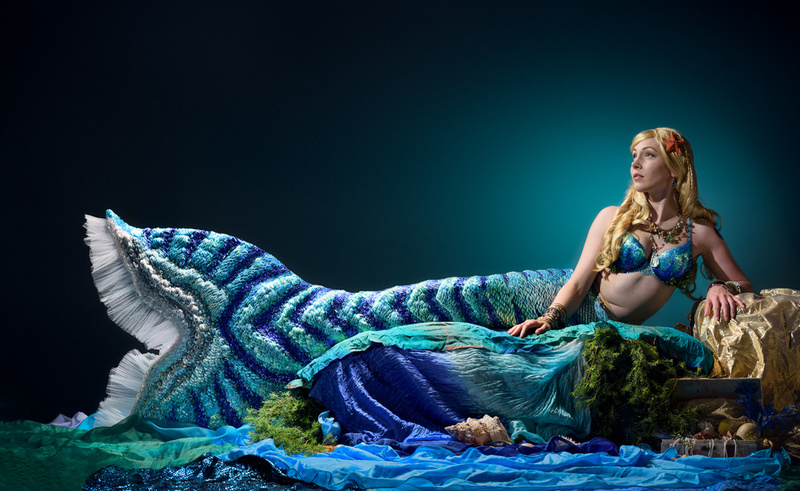 This is one of a series of promotional shots for my mermaid performer friend's new costume. It took 10 people more than 7 months to attached the 10s of thousands of individual sequins; it's suitable for use in and out of the water. The tail's called Dave, btw, and it's a she. The brief was to show the shape of the tail in full and the kind of sets that Lily creates for her installations / performances. It needed to have some drama but still have all the elements clearly visible - including, if possible, the iridescent scales. Lighting was a significant challenge - there's a gridded stripbox above and slightly behind, a snooted speedlite on the face and another aimed at Lily's lap to catch some irridesence. There was a silver Sunbounce reflector below in front and another to camera right. Lastly there was a gelled light on the backdrop in a standard dish. The snoots were Pringles tubes - the silver interior gives a nice soft edge to the spots and a degree of diffusion. Processing was mainly cleaning up the background, a bit of dodging and burning and a small amount of toning.